Faculty and student leaders plan an evening of activities to welcome the incoming year one students in each College. It’s an opportunity for new students to meet faculty advisors and upper classmen. An informative evening to help fourth year students prepare for residency interviews. There is a resident and faculty panel discussion framed around student questions and each student then has the opportunity to practice two 3-minute interviews with faculty in their chosen field. The Olympics are 3-day event that combines friendly competition and college sprit building as students participate in a wide range of activities ranging from basketball to dance to trivia to chess and anything you can imagine in between. It is a time for students to mingle with the colleges, to get to know classmates, and to form bonds to stand the test of time and the pressures of the medical profession and make memories that will never fade. 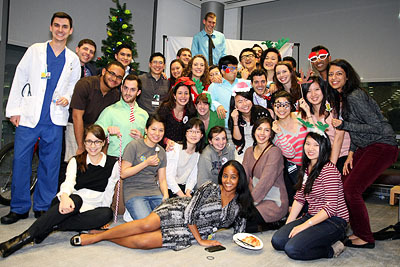 Students from all Colleges along with faculty and staff come together to celebrate by taking part in various activities such as a festive photo-booth, cookie decorating, games, making ornaments, dancing and singing. Some colleges choose to sponsor a family for the holidays or make holiday cards for those in nursing homes. It’s a good time of the year for everyone to come together and mingle. In this session, year two students learn how to prepare for core clerkships and gain insight from upper class students of what to expect. Faculty discuss the role and expectations of medical students and strategies to excel during clinical rotations. Year three students learn about decision-making/application process, gain specialty-specific information from Program Directors, build confidence in one’s choice of specialty and learn how to create a personal timeline for preparing the application including letters of recommendation. Program Directors from 20 fields participate to be available to provide information and support students. To stimulate and promote student engagement and community-building. To enhance connectedness and collaboration. To work collaboratively to plan programs and activities for your College for all medical students. To build leadership skills through active mentoring by faculty and senior peers. To represent the interests of students in your College. To support one another and address challenges together as they arise. Positions are available to all students. There is a place for every student that is interested in participating in the Colleges leadership. Time frame for leadership term is from early or mid-March through February of the following year (12 months). Cross-over training and pass off of duties happen just before or after upper level students’ spring break. Read the full Colleges Leadership Board description. Participate in structured monthly planning meetings within your College’s leadership team that includes your Colleges faculty leader(s). Participate in quarterly Colleges Leadership Board meetings – all faculty leaders and students leaders come together with the Director, Associate Director and staff. To create bidirectional communication with students in your College about community activities. Participate in any student leadership training session(s) that are offered. Fulfill expectations of the role you accepted as a student leader in your College. Each College is not limited to these roles and can vary in its content in order to meet the needs of your specific College. The descriptions below based on current positions provide a sense of what is needed within each College and provide a foundation to build upon. Leaders are responsible for overseeing the planning and work of the student leadership team within their college. Faculty leaders will provide guidance and mentorship as needed for students serving in these leadership positions to encourage a creative, flexible and collaborative work climate within the group. It is important that student and faculty leaders meet regularly and work together to enhance the learning and personal and professional development for all members of the College. The co-chairs are responsible for setting and monitoring the goals of the College, running meetings, delegating tasks as necessary, planning and executing the Induction Ceremony for MS1 students, and maintaining regular communication among the members of the board. The administrative chair is responsible for the daily logistics of the college. This includes taking minutes during each meeting, keeping track of all documents, updating the facebook page (if your College has one), and communicating with the student members/faculty of your college regarding updates. The Financial Chair is responsible for organizing the budget. Each year, receives a sum of money ($3,000) from the Colleges Advisory Program. The financial chair, with advice from the board, must prepare and monitor the budget for various events throughout the year (7/1-6/30) (e.g. Induction ceremony, Happy hour, Olympics, Match Day gifts, Y1 Stethoscope tags as gift for White Coat Ceremony, End-of-Year Party, etc). In addition, the financial chair is responsible for organizing reimbursements with Ms. Susan Shultz, sshultz@jhmi.edu. The social chair is responsible for organizing and promoting social activities for students throughout the year. This includes, but is not limited to, the annual MS1 Happy Hour, Holiday Party, Faculty and Alumni Lunches, Fun events, and End-of-Year Party. The social chair must work closely with the financial chair/treasurer to organize funds for the events. The historic chair is responsible for keeping a record of activities throughout the year for future reference. This includes taking pictures during events, documenting the logistics for each event, and providing information on the actual execution of events such as turn-out, goals accomplished, and recommendations for next year. The community service chair is responsible for organizing and promoting community service projects. For example: organizing trips to Habitat for Humanity, setting up fundraisers to buy gifts for less-fortunate families during the holiday season, making holiday cards for nursing homes, preparing meals at a homeless shelter, volunteering at a food bank, etc. The academic chair is responsible for participating in the organization and/or promoting various CAP educational sessions throughout the year. For example: the mock interview sessions for MS4 students in September. The academic chair will meet with the faculty leaders and student planners from each College to form a committee to work together in planning the Mock Interview session for MS4 students in September. These representative will be the liaisons for their particular class. The representatives are responsible for promoting your College’s events to your class as well as providing recommendations and perspectives to the student leadership board. The MD/PhD year representative will be the liaison for the MD/PhD students. The representative is responsible for promoting events to the MD/PhD students as well as providing MD/PhD recommendations and perspectives to the board. The School of Medicine and CAP actively support students in their transformational journey to becoming physicians, and the White Coat Ceremony marks an important milestone on this path. The presentation and cloaking of the white coat – a symbolic mantle of the medical profession – confers a commitment to the cherished values of being a physician: humanism, compassion, altruism, leadership, excellence and devotion to the well-being of others. 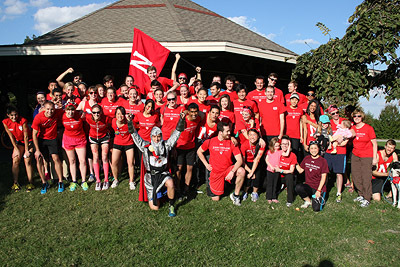 Many of the students from the class participate in planning this event over several months along with the Director and Administrator of the Colleges Advisory Program. This celebration is one of the highlights of the year for students and their families and takes place in the spring. This session follows the Applying for Residency program and focuses on principles for constructing high quality CVs and ERAS applications, it helps students to identify strengths and areas of improvement in their own CV through reflection and feedback, and a writing workshop to help students write their own personal statement or make improvements on a draft through faculty feedback. These small group advising sessions are held throughout all four years during the Topics in Medical Education (TIME) sessions. College advisors facilitate student reflection on the impact that training experiences have on one’s sense of self, developing professional identity and understanding the health care setting. Students consider how complex experiences throughout their learning/training offer opportunities for personal and/or professional growth. 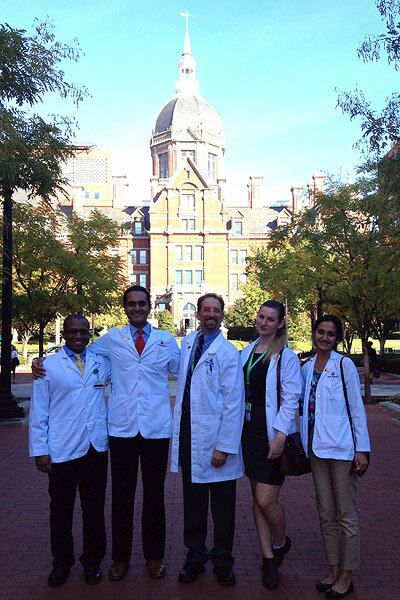 The Johns Hopkins School of Medicine Genes to Society curriculum pairs the human anatomy course and clinical skills training in the Clinical Foundations of Medicine (CFM) as the first two courses of the medical school experience. In CFM, students work in their Colleges small group “molecules” of 5 students along with their Colleges Advisor to learn these foundational elements of medical practice: physician-patient communication, building the medical history, performing a physical examination, working on a learning team, and understanding the attitudes and behaviors medical professionals. CFM faculty and staff appreciate the challenges students face in this early learning phase, and have designed the course as a gradual progression in skill-building and patient interaction. Class time in CFM is largely allocated to weekly afternoon sessions in Colleges molecules, as well as important supplemental communication and physical exam practice activities to reinforce group learning. Each small group session includes demonstrations and/or practice opportunities with personalized feedback to each student.